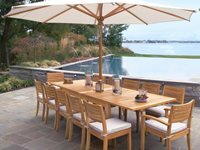 All American Fine Outdoor Furnishings is your one-stop source for quality patio furniture. 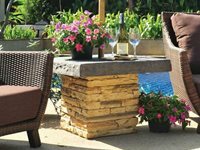 If you’re looking to bring indoor luxury outdoors, All American offers designer brands in a variety of materials including wrought-iron, aluminum, wicker and more. It has been said that good things come in threes. We’ve been entertained by three bears, three blind mice and three musketeers. Three course meals leave us with full bellies, triathlons consist of three exciting events, a three-peat gives sports fans reason to celebrate…and the list continues. Come on, admit it, you own a few pairs of knock off shades and maybe a handbag or two. And your friends think they’re the real deal, right? So why pay the higher price when the quality and appearance are no different? The same goes for patio furniture. 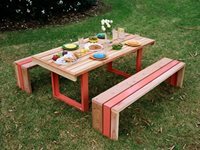 Why pay for an expensive teak set when you can get the same look with western red cedar, but at half the price. 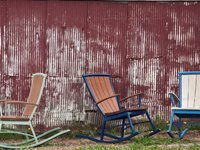 If you’ve lived in the South it’s likely that you have fond memories of lazy summer afternoons sitting in a rocker on the porch with a glass of sweet tea. The typical image that comes to mind is a stately home with a pair of traditional wooden rocking chairs. If you’re looking to add Southern charm to your porch, but with a modern twist, these are the chairs for you. While loitering can be a problem in many public places, it is something true gardeners encourage on their property. 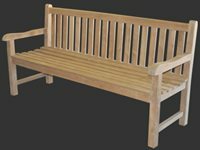 After all the hours you’ve spent planting and tending flowers, shrubs and trees, you want them to be appreciated. . You could hang up a sign that says “PLEASE LOITER” or you could get a beautiful bench that sends the same message. For those of you who are fans of Captain Jack Sparrow and wish you could join his crew, you better ask what type of wood his ship is made of first. Teak is the best wood for boat decks because it is durable and low-maintenance. That means less swabbing the deck and more swash-buckling. If you were lucky enough to live near the beach as a child, or even vacation there in the summer, it's likely that you had a sand dollar collection. Well, here's a totally different take on a childhood memory. Check out this fun, quirky and stylish table from Scout Regalia. Warning: it may cause you to start dressing your pets and serving them cocktails at dinner parties. The hammock has been reinvented. 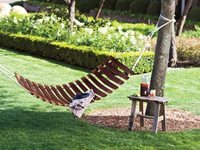 Check out this unique handcrafted hammock made from reclaimed wine barrel staves. 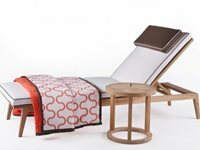 The wooden design plays with the boundary between hammock and furniture. 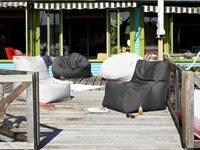 Check out these fun outdoor bean bag chairs and chaises from Australian company Eco Outdoor. The bean bags have a waterproof lining and are covered in durable outdoor fabric. They'd make a great addition to a trendy pool design or casual deck. 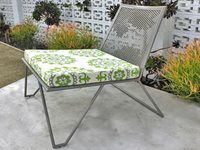 The Haskell Collection is a line of modern outdoor furniture that is eco-sensitive and durable. With previous experience in steel and fashion, the couple that designed the line likes to think of the collection as sophisticated, yet fun. The furniture is perfect for urban rooftops, suburban backyards or restaurants and hotels. Artist Curt Levine, owner of The Giving Tree in Pine Valley, California, creates amazing twig furniture . 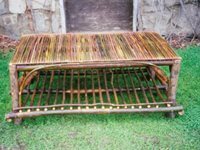 He grows and harvests his own raw materials, as well as designs and builds the willow furniture himself. His unique, rustic pieces would look great in a country or southwestern style garden. 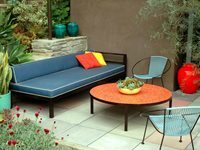 Elysian Landscapes, a well-known LA landscape design firm, also offers design conscious outdoor furniture. 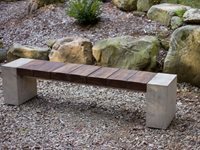 The line, called Plain Air, features pieces perfect for a garden that needs something unique, something beyond the typical retail patio furniture. Their nesting, side, coffee and dining tables are topped in colorful glass tile, while their ottomans, benches and daybeds are clad in vibrant upholstery. Be sure to check out their online gallery for inspiration. 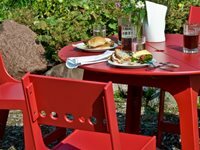 Loll outdoor furniture is unique because it is designed with two goals: use 100% recycled materials, and produce long-lasting, no-maintenance pieces. 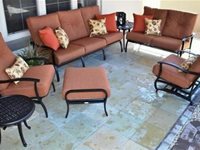 The patio furniture Loll produces has a fun, modern and colorful style. 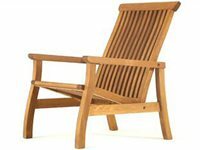 They've put a twist on classic outdoor designs such as the Adirondack chair and chaise lounge. Plus you can feel even better about purchasing one of their sustainable products because they plant a tree for every order.